I surprised K with a giant container of bubbles and a big bubble wand yesterday after camp. She loved the bubbles but quickly lost interest when she spotted a frog in the pool. She loves frogs! She asked if she could get in the pool in her clothes and she was surprised when I told her she could. 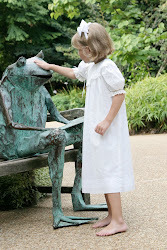 She played with the frog for quite a while, gave him a ride on her head and, of course, had to give him a kiss. Alas, no prince!